Labour and the Conservatives are still locked together in the polls, with 33% apiece in our average. 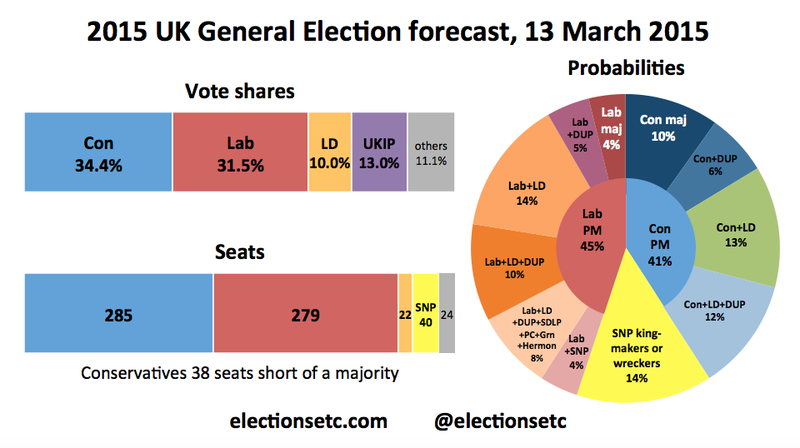 Our model expects the Conservatives to out-perform current polling by about 1.5 points come election day, and Labour to under-perform it by a similar amount, giving our central forecast of Con 34.4%, Lab 31.5%. Having last week become slight favourites to win the most seats, the Tories keep that position, with a 55% chance to Labour’s 45%. With a hung parliament looking very likely (our model gives an 86% chance of one), a lot of attention is now focused on which party groupings might form to give a governing majority. On our Parliamentary Arithmetic page, we’ve updated our explanation of the assumptions we make in drawing the pie chart above, showing the probabilities that particular groups of parties would both have a parliamentary majority and effectively control the government. We assume that, if either the Conservatives or Labour are just short of a majority, they will try to govern with just the DUP if that is sufficient for a majority, if not then just the Lib Dems, and if not then both. In fact, the DUP, the Lib Dems or both are enough to give the largest party a majority about 60% of the time. There’s also an 8% chance that Labour would be able to get to a majority if they can add at least some of the smaller left-wing parties (the SDLP, Plaid Cymru, the Greens) and Sylvia Hermon. That leaves an 18% chance of an outcome where Labour or the Conservatives would be reliant on the SNP either supporting them or at least abstaining on confidence motions. Can the SNP be described as kingmakers when they have no choice over who to back? Supporting Cameron would be political suicide; Labour’s hold over the SNP is as strong as the SNP’s hold over Labour might be. I do think your forecast of 279 Labour seats and 40 SNP seats is too optimistic. The figures must be based on the assumption that Labour can afford to lose over 30 seats in Scotland (up to 34?) and still end up gaining over 51 seats in England and Wales, to reach your 279 (projected) total. Labour only had a total of 258 seats in 2010, and this figure included the vast majority of Scottish seats. Can anyone also explain why the bookies currently give Cameron an (approximately) 2 -1 on chance of staying as PM after the election, whereas they rate Miliband’s chances as substantially less than evens? Perhaps we should be betting on Miliband?! The bookies have no inside knowledge – their prices just reflect the betting market. Personally, though, I’d bet on Miliband as I believe he’ll have a better chance of assembling a majority in the House of Commons.